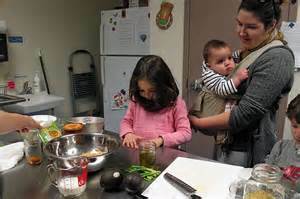 I recently saw a book that promised to help parents bond with their children while learning to cook with them. While at first thought, this might seem like an admirable idea, it left me wondering at what age we should teach our children to cook and thereby bond with them. Mentoring kids is a catch phrase. I was raised in a traditional family where my Dad worked to support our family and Mom was a stay-at-home mom, although she did help Dad with the family business. We also had a small farm, so life was usually busy. I doubt any parent actually thought of mentoring kids, they just lived life with their kids. I don’t remember learning to cook with my Mom; I was always with her as she prepared meals and baked our favorite treats. At some point, I baked my first loaf of bread, made fudge on the stove, and cooked the family dinner. I’m not sure when I did each; they were not stellar events that were photographed and bragged about; they were just what we did. My 3 siblings and me each learned life’s basic skills on a daily basis. We also helped change the oil in the cars, maintain the lawn mower, and repair screens. Everything was fair game for children helping with and thereby learning to do. When our children were born, I never thought about when to teach cooking, cleaning, and laundry skills. With children at my side the entire way, I prepared meals, washed dishes, and kept up with the lawn maintenance, too. Very young children helped fold clothes and put them away and often opened cans, stirred batter, and helped set the table. At some point, each prepared entire meals, managed the laundry, and tackled home maintenance projects. These milestones were not featured on Facebook and we didn’t celebrate; it just happened as we lived life together and they grew into successful adults, capable of managing their adult lives. Some events were of course promoted. Baking a special birthday cake or rebuilding an engine was more than routine. But basic skills were expected and although appreciated, were not a huge deal. Mentoring kids, mentoring our children is a daily process if we live with them and allow them to experience routine skills. As babies, they see Mom and Dad cooking, cleaning, and maintaining the home. When will they learn each skill? Over time and when they are ready. It will happen, not in a major celebratory fashion, but rather as a process, over time. And when they in turn are self-sufficient adults, they will know those essential life skills and be ready to teach their own children. What a great legacy to leave your children!